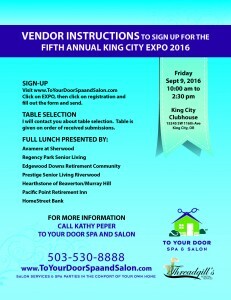 This will be the 5th annual King City EXPO. This year there are 5 residential senior communities that will be providing a beautiful lunch to the King City and Summerfield residents. A wide verity of over 65 vendors with be there that range from In Home Health to Northwest Senior Theatre. Don’t miss this wonderful event to meet businesses and non profits that serve the senior communities.